Using eyebrow wax is a faster, easier alternative to plucking or tweezing when eyebrow shaping. Knowing how to properly use the wax, however, is the key to a great look without unnecessary hassle. Waxing eyebrows is a longer-lasting method of brow shaping than tweezing or threading, but the biggest downside of this process is the pain. Rather than pulling out one stray hair at a time, nearly every hair is removed at once, a process that also strips the uppermost layer of skin cells and can be extremely painful. This is especially true for individuals unaccustomed to wax treatments. On the other hand, the pain is temporary is easily soothed, and the results last far longer and stay smoother than with other hair removal methods. Before waxing, it is important to review the different types of wax available and investigate their ingredients for potential allergic reactions. With the proper product, waxing can be easy, but it is also vital to use the proper method to avoid catastrophic results. 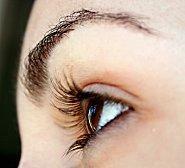 Wash the eyebrow area carefully to remove all makeup, oil, and dirt that could prevent the wax from adhering properly. Numb area with ice if desired. Determine the desired brow shape by using a photograph or examining brows in the mirror. Step back from the mirror to gain perspective on what the look will be from several feet away, and use a brow pencil to outline the preferred shape. Eyebrow stencils are available to help create symmetrical, even shapes. Heat the wax to its recommended temperature for optimum results. Note: Heated wax can be very dangerous if it accidentally comes in contact with the eye. Never overheat wax or burns may result. Comb brow carefully with a brow brush or toothbrush, following its natural shape and hair growth. Use a toothpick or similar item to part the brow along the desired shape. Apply wax carefully in the same direction as hair growth to keep the brow smooth. Apply small amounts of wax to minimize drips and maintain control as well as to avoid removing too much hair initially. Press linen strip(s) to wax firmly and wait several seconds for wax to adhere. Pull skin taut and remove strip quickly, pulling in opposite direction of hair growth. Repeat as necessary to remove all hair for desired shape. Use tweezers to pluck stray or too-short hairs that the eyebrow wax did not remove. Clean brow area to remove any leftover wax that could clog pores or cause ingrown hairs. After waxing, avoid applying sunscreen, makeup, lotion, or other chemicals for several hours to give skin a chance to adjust - waxing removes the top protective layer of skin cells, and redness or puffiness may result temporarily. If desired, soothe newly waxed skin with ice, but if a harsh reaction occurs or if redness does not subside after several hours, consult a physician about potential allergic reactions. Waxing is a time saver. 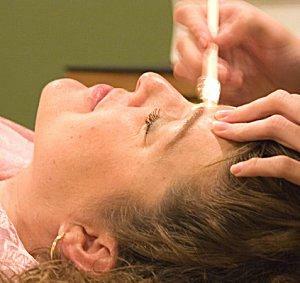 Applying wax to the brows removes dead skin cells and fine tiny hairs. Limits the chances of having an ingrown hair. Beauty salons frequently offer eyebrow wax treatments, and because waxing in the mirror can be tricky, a salon treatment may be faster, more efficient, and yield better results than a home treatment. Eyebrow treatments are among the least expensive beauty treatments, frequently costing less than $15, and a professional's expertise can help minimize pain and discomfort. On the other hand, performing the treatment at home allows more experimentation and it ultimately costs less than repeated salon visits. Individuals who have never waxed before may want to indulge in one or two salon treatments first, however, to gauge the effectiveness of different techniques before attempting it on their own. Individuals with extremely sensitive skin or who are sensitive to pain should consider avoiding wax treatments altogether. Furthermore, individuals with unsteady hands will not want to wax their own brows for fear of noticeable mistakes or accidents with the heated wax. Waxing should also not be attempted if the skin is sunburned or if there are ingrown hairs, cuts, or blemishes that could be painfully exacerbated by the wax. A proper eyebrow wax treatment can create a stunning new look in just a few minutes. While this treatment may not be for everyone, it can help many people achieve startling results for relatively little expense, time, or trouble.